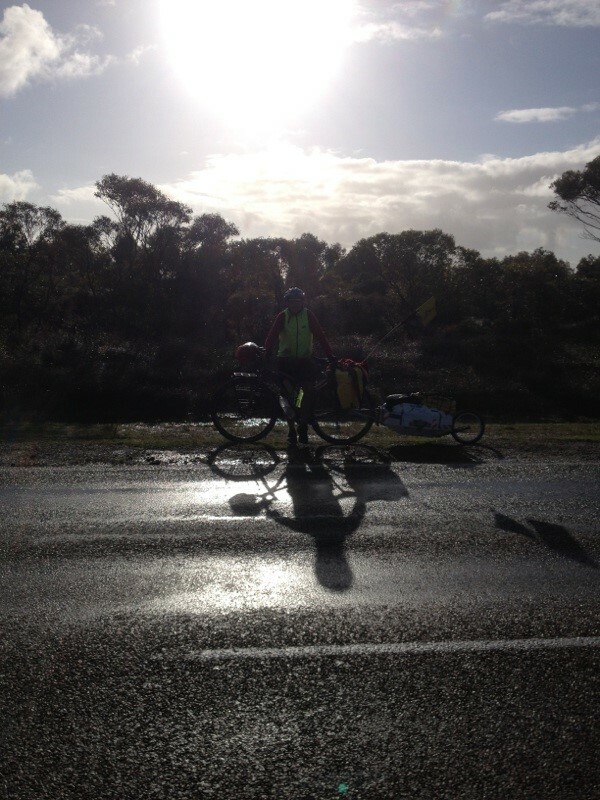 Munglinup to Esperance 110 Kilometres. In Munglinup I set up camp under the only bit of shelter I could find, which happened to be the Welcome to Munglinup sign. Not that anybody at the roadhouse across the road seemed to care. With a roof over my head, I set about strengthening my camp against the impending storm. I carry an extra lightweight tarp that I put to good use as a second fly. The hail pinged off the roof above me like ducks being knocked over at a side show shooting gallery. After a fitful sleep, I woke to the hissing sound of air breaks as hungry truckers pulled in for breakfast. As a caterpillar transforms into a butterfly upon exiting its chrysalis, I crawl into my coffin sized tent a grub only to come out grubbier. The clothes that aren’t damp smell. I stand back from the counter when ordering in shops lest I offend. I do get some quizzical looks. 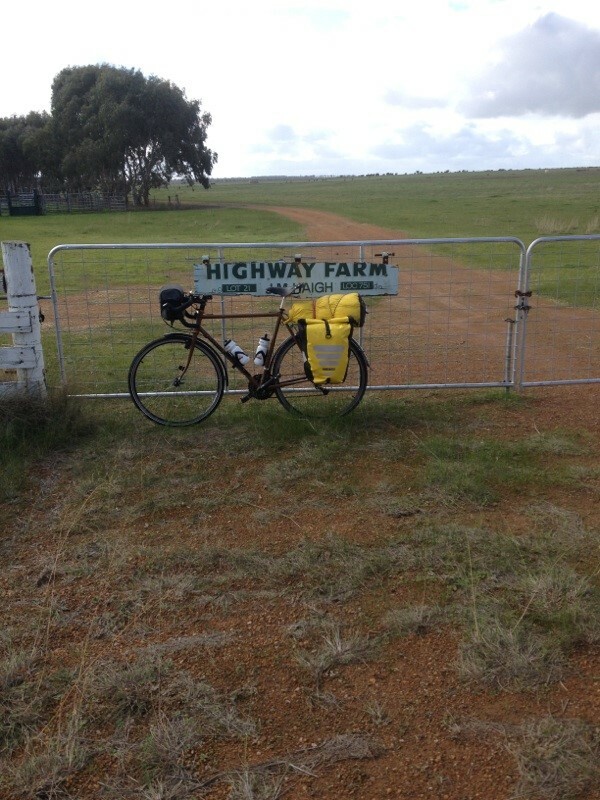 Well it was a red letter day today, about 15 clicks out of Munglinup I saw another solo touring cyclist heading my way!!! 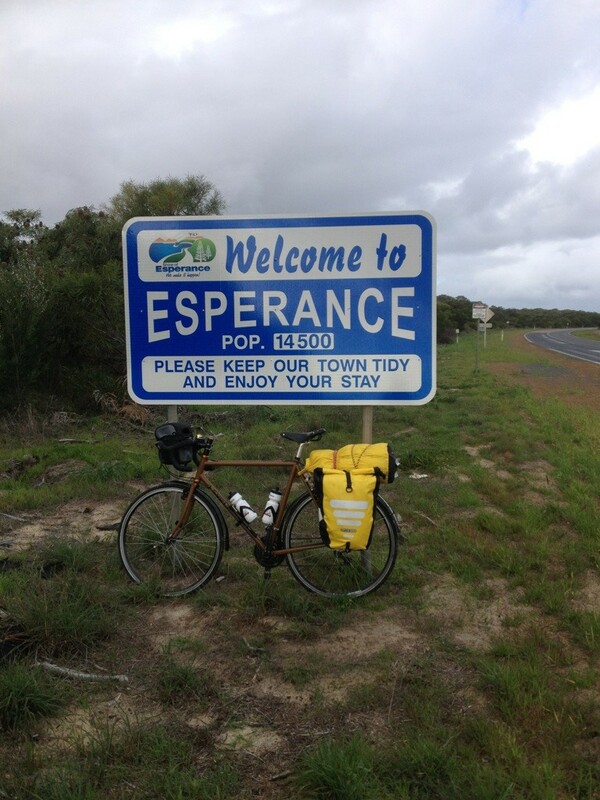 Graham, a Kiwi, was riding around the world for prostate cancer awareness (sounds like a pain in the arse). I will just mention Graham was also riding a Surly (Ogre), with a Brooks saddle. Our bikes got along famously, Graham was looking forward to meeting up with his wife in Albany. We parted ways with a wave. Who knows Graham we may well meet up Tibet in April next year! In places the roadside verge was non existent today, not that that deters the road trains who give a cyclist no quarter. Still, I kept focused in the changing weather/road conditions: With my mind on Esperence with those seaside views. Stopping for a “Nature Break” I absentmindedly stood on top of a bull ants nest. I didn’t realise until they began biting my ankles and I managed a speedy exit with my dignity intact. It could have been worse! Tomorrow it’s time to head away from the coast to Salmon Gums where I will bush camp. After that it’s Norseman and the Nullarbor Plain where services are few. I will be packing extra food and water. There will be no internet access so my be off the radar for a while. Lucky a Bull Ant didn’t latch on to the “old fella”. Stay safe man. Is that you Jan? Thanks to you and everyone for your encouraging messages of support.